Kavan Ratnayaka has been appointed the new Chairman of Sri Lanka Ports Authority (SLPA). 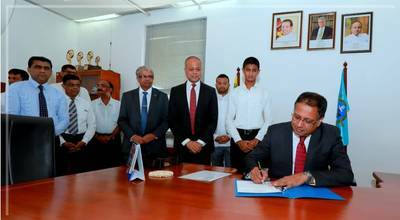 Ratnayaka assumed duties as the Chairman of Sri Lanka Ports Authority (SLPA) last week. Before his appointment as the Chairman of SLPA, Kavan Ratnayaka served the Chairman of the Sri Lanka Tourism Development Authority (SLTDA). He is also a former Chairman of Associated Newspapers of Ceylon (Lake House). An old boy of Royal College, Kavan Ratnayaka holds a Bachelor of Science degree in (Physics) of the University of California. He has also served as the Country General Manager of IBM Sri Lanka, Chief Executive Officer of Dialog Broadband and the Chief Corporate Officer of Dialog Axiata PLC. Minister of Port, Shipping and Southern Development Sagala Ratnayaka expressed his confidence that Kavan Ratnayaka as the new Chairman of Sri Lanka Ports Authority (SLPA), with experience in both public and private sector will steer Sri Lanka port Authority and the Port of Colombo to this position. The Minister also stated that the port of Colombo that has almost reached to its capacity with collaborative teamwork of the Jaya Container Terminal of Sri Lanka Ports Authority (SLPA), the South Asia Gateway Terminals and the Colombo International Container Terminals should be further developed into one of the leading ports of the world.